What a wonderful day out on Saddle Mountain Saturday January 28, 2017. Friends of Saddle Mountain members Paul Roetto, Judy Shaw, Peggy Sites and Carol Millette, were joined by the Ambassadors club from Saddle Mountain High School, Teacher Tina Salazar, Students Karsyn Chamberlin, Kaylynn Matlock, Morgan Pierce-Tallent, Arielle Tallent, Miriam Malendez, Cheyann Glattfelder, Wesley Green, Hailey Bunch, Riley Hodges, Rayne Penn and Noah Smith. Parent, Tracy Wolfe-Hodges . All joined together to make quick work of January’s roadside clean up and several desert locations where trash had piled up. Saddle is a much cleaner place thanks to all their efforts. 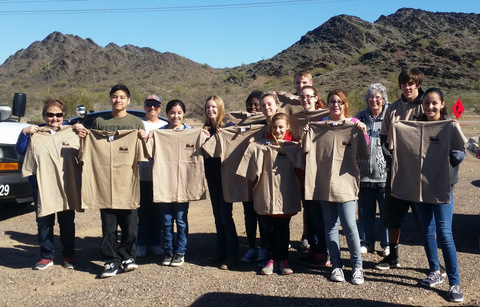 FoSM presented all the students with certificates making them honorary members of Friends of Saddle Mountain and presented them all with T-shirts. We hope to see them all again soon and hope the next time they will have time to have a hotdog roast with us. Copyright © 2013-2017 Friends of Saddle Mountain (FoSM). All rights reserved. Website design by N-ergizing Websites.